Sodrel picked up two points-- from 40 to 42%-- and Hill dropped 2%, from 51 to 49%. Also keep an eye on Libertarian Eric Schansberg, who won 4% in 2006 and gets 5% in this poll, although he draws his support evenly from both parties. 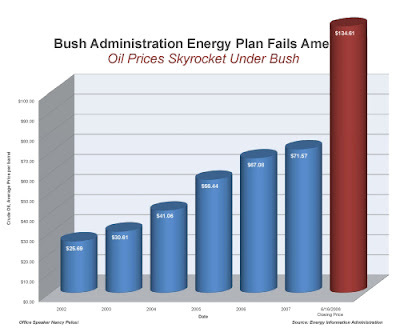 The last/red column points to a higher price of oil-- when Bush has been President (yes) AND the Dems have controlled Congress. The chart lines halt at $100, yet the bar for 2008 essentially goes that far and no higher. The bar for 2007 is 178 pixels high in that image (about 2.48 pixels per dollar in the price of gasoline). The bar for 2008 is only 251 pixels high. In order for it to be the proper size in proportion to the rest of the graph, it would need to be about 333 pixels high (another 33% higher, actually). Oil prices have gone up more in the past seven months under the Democrat Congress than they went up in the prior seven years of the Bush administration (six of which saw the Republicans controlling Congress). 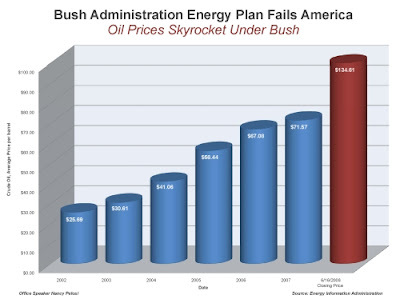 It seems clear to me that the graph should actually be entitled: "Democrat Energy Plan Fails America - Oil Prices Skyrocket Under Democrat Congress." True, but Bush and the GOP Congresses in 2001-2006 share the blame as well-- both directly and indirectly. Indirectly: The GOP being Dem-like yahoos on spending led to their being booted from Congressional control in 2006. Thanks to the GOP lack of principle on fiscal matters-- and our on-going efforts in Iraq-- we've had to live with Dem control the last two years. But here we have the Democrats at the state level talking about the cost of a Sodrel proposal while completely ignoring its benefits! Despite the rising cost of food and gas, Republican Mike Sodrel wants to raise taxes on food and gas by an additional 23 percent. What's missing? Only a little thing like getting rid of all income and payroll taxes! Then, they play the "Millionaire Mike" card. Classy! How about spending less time playing the class-warfare card and more time doing honest policy analysis? * The Indianapolis Star reported that Sodrel was "one of the wealthiest members of the [Indiana] delegation," with an estimated personal worth between $6.5 million and $27.6 million. Paid for and authorized by the Indiana Democratic Party, Daniel J. Parker, Chair. This communication is not authorized by any candidate or candidate committee. Kenielle Finch’s arrest Friday in the hit-and-run deaths of two little girls was at least the fourth time he has been charged with fleeing from police, including a May 2001 incident in which Finch jumped from his moving vehicle, leaving the car to smash into an apartment building. Uhh, no....he's not "a good guy"-- in a Christian or even a secular sense. Please join me in praying for his soul and the grief of the families involved in this evil act. As we start into the Olympics, it's perhaps fitting that Republican President Bush and the Democratic Congress have just set a new world record-- for the largest deficit in one year. And sorry about that depreciating dollar! When will we bring back fiscal conservatism? Despair.com has just released their latest beauty-- on government! One of the staples of economics-- not just the cost of production or the price of the product, but "the cost of making a trade happen". Most obviously, this refers to search costs-- the cost of finding and getting a product, the costs of communication and transportation. Dramatically lower transaction costs have been arguably the most important economic story over the last 30 years-- and inarguably, the most undersold economic factor over the last 30 years. Through massive technological advance and the deregulation of Reagan and Carter (the only good thing from the latter's presidency? ), transaction costs plummeted-- and with that, globalization began in earnest. The movement of factories to low-cost countries further and further away has been a bittersweet three-decade-long story for the U.S. economy, knocking workers out of good-paying manufacturing jobs even as it drove down the price of goods for consumers. But, after exploding over the past 10 years, that march has been slowing. But moving production closer to markets won't avoid all the problems associated with rising transportation costs. Manufacturers face hefty surcharges on domestic shipments by truck and train. And already congested domestic transportation systems may have difficulty handling a sudden upswing in demand from manufacturers buying and moving more raw materials and other supplies over U.S. rails and highways. Moreover, in certain industries the advantages derived from offshore production continue to trump higher transportation costs. Electronics firms, for instance, are now clustered in Asia and gain a major benefit of proximity to one another. Volunteers generally aren't compensated for their efforts, but Sarah Boesing has received $3,000 for her work with Break the Grey, a support group for families dealing with childhood cancer. The 18-year-old New Albany resident is the recipient of this year's Metro United Way's Youth Scholarship Award. Break the Grey, a ministry founded by Boesing in 2006, provides gifts, refreshments, parties and supplies to families at Kosair Children's Hospital in Louisville and Riley Children's Hospital in Indianapolis. "I called it Break the Grey because we hold our events in the winter months, when it's really grey and gloomy," Boesing said. "It's pretty much just a party, because parties are fun," she added. "We take toys and wrapped gifts so they actually get to open them. And we always take something for the siblings, too. Boesing knows firsthand about children being confined to a hospital. She was diagnosed with a terminal kidney disease while her mother, Terry, was carrying her. The doctors "told my mom several times that I would never be born," Boesing said. Then "at age 11 the doctors gave me six months to live without dialysis or a kidney transplant," Boesing said. In August 2001, she received a transplant at Kosair. "The kidney unit and the cancer unit are on the same floor, so I hung out with those kids a lot" when she was in the hospital, Boesing said. Her ideas for Break the Grey took shape during the summer of 2005, before her sophomore year at Christian Academy of Indiana in New Albany. She approached her schoolmates for help, and the first "Break the Grey" party was in January 2006. Items for the parties are collected by the student council at the school, where Boesing graduated this year. "Ultimately, I hope to make it an independent nonprofit organization and move beyond just parties," she said. Boesing has also donated time to Wayside Christian Mission in Louisville, the Cancer Care Center at Floyd Memorial Hospital and Dwelling Place, a soup kitchen in New Albany. The Metro United Way has offered the Youth Scholarship Award for 21 years; 65 teens applied this year from through the area served by Metro United Way, which covers Floyd, Clark and Harrison counties in Southern Indiana, and Jefferson, Bullitt, Oldham and Shelby counties in Kentucky. The high school seniors are judged on academics and their volunteer work. Only one is chosen to receive the scholarship. Boesing will start classes at Anderson (Ind.) University this fall, where she plans to study nursing. "After spending a good amount of time with these children, I have decided to become a pediatric oncology nurse." Adolph Kiefer: the most important person in the history of (Olympic) swimming as a sport? After turning 90 on Friday, Adolph Kiefer will rise early this morning and swim. That has been his routine since childhood, since before the 1936 race in Berlin that earned him an Olympic gold medal. He doesn't plan to stop. "I know I won't get to 200, but gosh darn it, I'm going to try," Mr.Kiefer said last week after finishing a 35-minute swim inside his rural home. Of all the swimmers participating in the U.S. Olympic trials, which begin Sunday in Omaha, Neb., none is more tenacious than Adolph Kiefer. Once a medal winner at the trials, Mr. Kiefer now owns a company that furnishes the event with stopwatches, whistles, pace clocks and other equipment. A new responsibility this year: running (on behalf of Speedo) the official retail shop inside the trials arena. Mr. Kiefer's 61-year-old catalog company has been opening retail stores for less than 10 years. "We're making progress," he says. To many swimmers today, Kiefer is just a brand of kickboard. But in the 1930s and 1940s, the man behind the brand was a national celebrity, appearing in advertisements for products such as Lifebuoy soap and Gillette razors, and performing at swimming exhibitions around the country. "Back then, America's top swimmers were better known than Michael Phelps is today," says Bruce Wigo, chief executive of the International Swimming Hall of Fame in Fort Lauderdale, Fla. Several Olympic swimmers of that era -- Johnny Weissmuller, Buster Crabbe, Esther Williams -- became Hollywood stars. For 12 years, Mr. Kiefer dominated international races in the backstroke as well as the individual medley. In a career that spanned more than 2,000 races, he lost only twice. One of his world records stood for 12 years. "I've been honored to be mentioned alongside the greatest backstrokers ever," says Lenny Krayzelburg, the just-retired four-time Olympic gold medalist. "And Adolph's name is always one of the first to come up." Mr. Kiefer's only Olympic competition won him a gold medal at age 17, along with a handshake from Adolf Hitler, who went on to launch the war that canceled the Games of 1940 and 1944. Mr. Kiefer says he has never lamented the Olympic medals he likely lost to the war, because military officials in Washington gave him a more-important challenge: creating and running a program to teach sailors how to swim. "We were losing more men to drowning than to bullets," says Mr. Kiefer, a Navy officer during World War II. "I'm prouder of any lives I saved than of the gold medal." By 1948, when the Games resumed, Mr. Kiefer was a father of two and founder of a fledging swimming-goods business called Adolph Kiefer & Associates. Today, Mr. Kiefer is known throughout the aquatic industry for his innovations. In an era of cotton and wool, Mr. Kiefer introduced the first nylon suit, making Kiefer the swimsuit of choice in the 1952 Olympics. In the 1960s he developed the first turbulence-resistant lane line, using buoys that absorb rather than bounce back swimmers' wakes. Other innovations have involved water skis, chlorine treatments, rescue devices and spine boards. At the moment, Mr. Kiefer is working with the federal Centers for Disease Control on technology to combat the spread of chlorine-resistant bacteria that have caused outbreaks of illness in public pools. "Adolph Kiefer is absolutely on the cutting edge of the swimming industry," says Michael Beach, a scientist and associate director for healthy water at the CDC. "He's 90 years old, and yet he's present at every meeting on this issue." Kiefer & Associates has never thrived financially off its founder's inventions. Mr. Kiefer has never enforced one of his 14 patents, in part because he believes his improvements ought to be available to purchasers of every brand, and in part because he thrives off the success of other brands. The revenue engine of his $20-million-dollar-a-year company is a catalog touting "everything but the water since 1947," from the Telescoping Rescue Pole & Life Hook ($57.90) to the latest offerings from swimsuit maker Speedo. The Kiefer catalog is a fixture among pool owners and among swimmers who know that sporting-goods shelves are often bereft of aquatic equipment in fall and winter. "It has never been Adolph's motivation to dominate the industry or make a lot of money," says William Fischer, a nephew who manages the business. "His goal has always been to make swimming safer and available to everyone." Once teamed with baseball slugger Ted Williams to promote public swim instruction, Mr. Kiefer continues financing efforts to teach children, particularly minorities, how to swim. Mr. Kiefer has strong opinions about a new generation of swimsuits featuring polyurethane, which he says boosts buoyancy. These suits, such as Speedo's LZR, are worn by many competitive swimmers and have drawn controversy, as some critics say they give an artificial advantage. Although some makers of the suits, including Speedo, sell their products through his catalog, Mr. Kiefer says he is among those who think the suits should be outlawed in competition. To illustrate why, he recalls breaking a world record in the 400-meter backstroke in Copenhagen in 1935 and then being told his record was disqualified because the pool was found to contain a significant level of salt water, which boosts buoyancy. "Just like salt water, this new suit provides artificial buoyancy," he says. The high-tech suits are approved for the Summer Games in Beijing. "Although the Speedo LZR Racer does help a swimmer maintain a streamlined body position through the water, the suit is not buoyant and fully complies with FINA regulations," says Speedo Vice President Craig Brommers. FINA is the international governing body for competitive swimming. U.S. Olympic officials believe Mr. Kiefer is the nation's oldest living aquatic gold medalist. To judge from the early deaths of his parents and seven siblings, his high-quality longevity is not genetic. Friends and relatives say one explanation is marital. When 88-year-old Joyce Kiefer, a former water-ballet performer, isn't mowing their expansive lawn or scrubbing down the extra refrigerator in their garage, she is accompanying him to the offices of Kiefer & Associates, where she manages the accounts-receivable department. Keeping up with her is a constant challenge for the competitive Mr. Kiefer. The two have been married so long, 66 years, that their four children are grandparents. Nodding at an infant sharing his office at company headquarters one recent day, Mr. Kiefer says, "That's our 11th great-grandchild." A condition called idiopathic peripheral neuropathy has stiffened Mr. Kiefer's hands and robbed him of the balance needed to walk without assistance. One recent morning, he used a walker to travel from his bedroom to the natatorium on the far side of his house. Crawling into a resistance pool wearing baggy shorts, he told a visitor: "Usually, I do this naked." In the water, his long backward strokes offer a hint of the power he once wielded. But he no longer swims like an Olympian. His is the routine of a 90-year-old seeking to limit the effects of an incurable disease, and he is succeeding. His chest and legs remain muscular, giving him the strength to use a walker, to pull himself out of chairs, to remain self-sufficient more than two decades after his neuropathy first struck. "Anybody else with his level of neuropathy would be getting pushed around in a wheelchair," says Gail Lucks, a Denver anesthesiologist who is passionately subjective on this topic. Mr. Kiefer is her father. I enjoy his blog, Osi Speaks! and I love this picture. He seems like really good people; I hope I get to meet him someday! I came here in 1981...from Nigeria. About 200 miles east of Lagos. I had just finished high school and was a teenager -- an idealistic teenager -- but very independent. I had always wanted, based on what I had read about America and the American Constitution, and what I had seen on TV, I had the notion that I wanted to be an American. That's because of the ideas that caused the founders to put their thoughts in writing in the Constitution. And I was intrigued by the fact that they all ran away from oppression everywhere and came here to found a country that was free of oppression, where everyone enjoyed all the liberties that were denied them wherever they came from. Having grown up in Nigeria, I could see how the government denied people their rights. In fact government, to the most extent, really felt that the people didn't have any rights, so the government could do anything it wanted to do with the citizens. America's a big country. How did you decide where in America to go? So then I looked at the map and I found the Midwest and started applying to schools, and I was admitted to Nebraska Wesleyan University....where I received my first degree, which was in business administration, personnel management emphasis. You experienced the hope in coming to this country. The reality of being here has to be a little different. Has it tempered your enthusiasm over the years? It sure has brought a lot of disappointment to me. Some of the things I see happen today make me wonder if the founding fathers are just rolling around in their graves. One example: One of the things they ran away from, of course, was religious intolerance. Here we are. Everyday we've got to fight about whether Obama is a Muslim or whether somebody else is a Catholic before we decide whether to vote for them. This wasn't the idea. They did not want any kind of religious test, and here we are doing it. And when they said, "All men are created equal," they really meant it in their hearts, even though they didn't live it. Here we are today: racism everywhere. Folks who wouldn't vote for Obama were stupid enough to tell the whole world, "We are hicks over here, and we don't vote for black folks." Corruption: Africa is very corrupt. When I left, I thought I'd left all that behind. Being the idealistic me, I thought in the United States, you're not going to have that kind of corruption. Well, my sense is that I just left one corruption for another. The only difference is in degree, but not in substance. And I don't think that the founding fathers, when they came here to try this experiment, wanted to drag the corruption they were running away from to here. The world is in trouble when the guy dressed up as a bat represents order and sanity. But that's pretty much the thesis of The Dark Knight: The world is a bad place and it needs good people—people like Harvey Dent (the underrated Aaron Eckhart), an earnest, cartoonishly handsome district attorney who wants to rid Gotham City of corruption and organized crime. The problem facing Dent, Batman (Christian Bale, top-notch again), and the city's only clean policeman, Jim Gordon (Gary Oldman, quiet and good), is that corruption is as much a part of Gotham as its skyline or its bus system. Cops rat one another out to the mob, prisons are overflowing and porous, and, like a new species of mold developing in a dank house, there's a saturnine strain of crook who sins not because it's expedient or profitable, but on principle, or for laughs. In a word: Joker. Still, Dent might be the right man for the job. Basically conservative, Dent has such an attractive fearlessness to him that he inspires optimism and hope. In Dent's first scene, a mob crony pulls a Chinese-made ceramic pistol in the middle of a trial and tries to shoot him from the witness box. Dent takes the thug's gun away, smacks him, and suggests that his boss (who is on trial) buy American. It might be the only unrealized moment of violence in the film. The film's early reviews have been gently quizzical about the late, lamented Heath Ledger's magnetic performance as the Joker. It's obvious that he's doing a superb job, but nobody seems to know what he's doing. Let me clear things up: He's playing Satan. Ledger flicks his tongue like a snake, tempts people to kill one another, and is gleefully sloppy with bullets, bombs, and knives. Everyone else plays gangland archetypes; Ledger's Joker has escaped to the movies from Milton, or C.S. Lewis' Perelandra. It's hard to know what this character did to someone like Ledger, who flung himself into every role. What it does to the film, though, is create a character entirely opposite to Batman. He's a terrorist in the most basic sense of the word: Terror is not his means, it's his end. "Everything burns," he observes happily. The performance turns the grim movie into something more than a thriller—The Dark Knight ends up being a morality play on a titanic level. With its first feature-length film in 1995, Toy Story, Pixar changed the face of children's entertainment in Hollywood. Its innovative 3-D computer animation not only looked different, it told stories with a depth and humor that appealed to adults almost as much as kids. As the second animator hired by the studio, Andrew Stanton has been a constant force in shaping the creative direction of the studio's productions. He has done so to amazing success. Finding Nemo, which Stanton wrote and directed, stands as the highest-grossing G-rated film of all time. Of the top 10 films in that category, Stanton, now vice-president of Pixar's creative division, was writer, director, or producer on five. With his latest film, WALL•E, about to hit theaters, the Christian filmmaker sat down with WORLD. WORLD: Pixar has built a reputation not only for innovative visuals but for original storytelling with Finding Nemo, The Incredibles, Ratatouille, and others. How have you managed to maintain your integrity in a field that is famous for making lazy grabs at parents' wallets? STANTON: When Toy Story came out the media was making such a big deal about the technology, but what we were really interested in was the story. At the time everybody thought that the only way you could do an animated movie was to make it a musical fairy tale. We set out to prove that animation is not a genre, it's a medium that can be anything it wants to be like any other movie. And we've worked very hard to keep Pixar a director-driven studio where each of our films is conceived, inspired, and executed by a singular vision. I think that ensures it will be art first and a product second. It's a lot harder to make a good movie when you try to make a product first with a little bit of art in it. WORLD: How does WALL•E represent your singular vision? STANTON: Well, what really interested me was the idea of the most human thing in the universe being a machine because it has more interest in finding out what the point of living is than actual people. The greatest commandment Christ gives us is to love, but that's not always our priority. So I came up with this premise that could demonstrate what I was trying to say—that irrational love defeats the world's programming. You've got these two robots that are trying to go above their basest directives, literally their programming, to experience love. With the human characters I wanted to show that our programming is the routines and habits that distract us to the point that we're not really making connections to the people next to us. We're not engaging in relationships, which are the point of living—relationship with God and relationship with other people. WORLD: The depiction of humanity is pretty stark in this movie. STANTON: Well, when I started outlining humanity in the story, I asked myself: What if everything you needed to survive—health care, food—was taken care of and you had nothing but a perpetual vacation to fill your time? What if the result of all that convenience was that all your relationships became indirect—nobody's reaching out to each other? A lot of people have suggested that I was making a comment on obesity. But that wasn't it, I was trying to make humanity big babies because there was no reason for them to grow up anymore. WORLD: Now that you mention people misconstruing your intentions, how do you feel about reports that WALL•E is an environmental movie? STANTON: People made this connection that I never saw coming with the environmental movement, and that's not what I was trying to do. I was just using the circumstances of people abandoning the Earth because it's filled with garbage as a way to tell my story. I always knew that I wanted WALL•E to be digging through trash for two reasons: One, I wanted him to be the lowest on the totem pole. It's a janitorial job; it's the saddest, lowest status amongst his kind; and it just makes him that much more of a lonely guy. Two, trash is really visual. Even the littlest kid understands when there's stuff in the way and it needs to be picked up, so I didn't need to spend time explaining his job. And then I just reverse-engineered from there, "OK, if there's trash everywhere, how did it get there?" WORLD: As someone who is completely freaked out by rats, I was amazed that in Ratatouille you managed to make rats lovable. Now, in WALL•E, you've done something even more amazing—you've made cockroaches loveable! STANTON: [Laughing] Yeah, we [the animators] took that as a personal challenge. We said, let's not even design it cute—we'll make it look like a real cockroach and we'll still make it cute! I'm glad you think we succeeded. the market for second-hand clothing in Haiti...very cool! This is the sort of thing that gets economists really excited! When thrifty shoppers in Boston and Miami pick through secondhand shirts at local Salvation Army outlets or estate sales, they are as likely to meet Haitians as hipsters. Some of the immigrants will simply be collecting clothes to mail back to family in Port-au-Prince, but others are part of a large global network trading in used American goods. Haiti’s enormous, informal, and largely unregulated market in pepe—used items imported from abroad—plays an important role in the least developed country in the Americas. In 2002 The New York Times reported that of the approximately 2.5 billion pounds of clothes donated to charity in America each year, as much as 80 percent is shipped globally. The Times article inspired filmmakers Hanna Rose Shell and Vanessa Bertozzi to research the history of recycled clothing. From 2003 to 2007 they visited rag yards in Miami, dug through archives in London and Washington, D.C., and traveled to Haiti to see the international secondhand markets for themselves. The result is the recent documentary Secondhand (Pepe), which explores the global trade in used clothing. In the United States, demand for secondhand goods spiked during the Great Depression, but after World War II peddlers found themselves with excess supply. So the business went global. Third World countries arranged deals with U.S. thrift shops for items that otherwise would end up in the trash. When you see a photo of Haiti, it likely depicts a street riot or some similarly violent situation—the island at its worst. Secondhand (Pepe) spends a great deal of time documenting the country’s landscape in more peaceful times: a spectacle of colors, rags strewn for miles all over the dirt roads like a college dormitory on laundry day. It is at once beautiful and messy, a reminder that the country has far worse problems to deal with than litter. Haitians, we learn, are extremely resourceful, finding new uses for items that might seem like rags to us but can be refashioned into tents or used as stuffing for upholstery. They’re repurposed in other ways as well. A seamstress laments, “Pepe makes it hard to sell my garments.” But she also proudly displays the alterations she made to her blouse—darts in the front and shorter sleeves. Costing about 13 cents, her shirt looks like something that could be sold in Manhattan for $40. It’s difficult to be as optimistic for the workers inside Haiti. During the food crisis of last spring, the Associated Press reported that some Haitians were surviving on cookies made of dirt and vegetable shortening. But a little industry is better than none. Those rags for sale on the streets of Port-au-Prince might pave the way for more trade and opportunity. what happens when there's no paper to print (too much) money? It has come to this: Zimbabwe is about to run out of the paper to print money on. Fidelity Printers & Refiners, the state-owned company that tirelessly churns out bank notes for the Robert Mugabe regime, was thrown into a crisis early this month after a German company stopped supplying bank note paper because of concerns over Zimbabwe's recent violent presidential election, widely seen as fraudulent by international observers. The printing operation drastically slowed. Two-thirds of the 1,000-strong workforce was ordered to go on leave, and two of the three money-printing shifts were canceled. The result on the streets was an immediate cash crunch. "If you think this currency shortage is bad, wait two weeks. By then it will be a disaster," said a senior Fidelity staffer, who spoke to The Times on condition of anonymity because he would face dismissal and possible violence for talking to a Western journalist. The paper will run out in two weeks, he said. Everything's ok until this sentence. Economic paralysis is not likely (at least anything worse than what they're enduring now)-- if people understand that the inflation will change. Political paralysis is closer. In fact, political destruction is almost certain. Zimbabwe's economic meltdown harks back to the collapse of its major export industry, commercial farming, after Mugabe's controversial land reform program early in the decade. That left the nation starved of foreign exchange, but government spending went on. How did it do that? It printed money. But printing more and more money without an increase in productivity fueled rampant hyperinflation. Everyone at Fidelity Printers knows the money printing is propping up Mugabe, the staffer said. Despite the threat to their jobs, some secretly hope for breakdowns and paper shortages, he said. "I'm happy about this crisis caused by the unavailability of paper," the staffer said. "Because maybe it might lead to a change of things in this country." "The Far Left's War on Direct Democracy"
A total of 24 states allow voters to change laws on their own by collecting signatures and putting initiatives on the ballot. It's healthy that the entrenched political class should face some real legislative competition from initiative-toting citizens. Unfortunately, some special interests have declared war on the initiative process, using tactics ranging from restrictive laws to outright thuggery. The initiative is a reform born out of the Progressive Era, when there was general agreement that powerful interests had too much influence over legislators. It was adopted by most states in the Midwest and West, including Ohio and California. It was largely rejected by Eastern states, which were dominated by political machines, and in the South, where Jim Crow legislators feared giving more power to ordinary people. But more power to ordinary people remains unpopular in some quarters, and nothing illustrates the war on the initiative more than the reaction to Ward Connerly's measures to ban racial quotas and preferences. The former University of California regent has convinced three liberal states -- California, Washington and Michigan -- to approve race-neutral government policies in public hiring, contracting and university admissions. He also prodded Florida lawmakers into passing such a law. This year his American Civil Rights Institute (ACRI) aimed to make the ballot in five more states. But thanks to strong-arm tactics, the initiative has only made the ballot in Arizona, Colorado and Nebraska. "The key to defeating the initiative is to keep it off the ballot in the first place," says Donna Stern, Midwest director for the Detroit-based By Any Means Necessary (BAMN). "That's the only way we're going to win." Her group's name certainly describes the tactics that are being used to thwart Mr. Connerly. Aggressive legal challenges have bordered on the absurd, going so far as to claim that a blank line on one petition was a "duplicate" of another blank line on another petition and thus evidence of fraud. In Missouri, Secretary of State Robin Carnahan completely rewrote the initiative's ballot summary to portray it in a negative light. By the time courts ruled she had overstepped her authority, there wasn't enough time to collect sufficient signatures. Those who did circulate petitions faced bizarre obstacles. In Kansas City, a petitioner was arrested for collecting signatures outside of a public library. Officials finally allowed petitioners a table inside the library but forbade them to talk. In Nebraska, a group in favor of racial preferences ran a radio ad that warned that those who signed the "deceptive" petition "could be at risk for identity theft, robbery, and much worse." Mr. Connerly says that it's ironic that those who claim to believe in "people power" want to keep people from voting on his proposal: "Their tactics challenge the legitimacy of our system." The war against citizen initiatives has other fronts. This year in Michigan, taxpayer groups tried to recall House Speaker Andy Dillon after he pushed through a 12% increase in the state income tax. But petitioners collecting the necessary 8,724 signatures in his suburban Detroit district were set upon. In Redford, police union members held a rally backing Mr. Dillon and would alert blockers to the location of recall petitioners. Outsiders would then surround petitioners and potential signers, using threatening language. Mr. Dillon denied organizing such activity. Then it was revealed two of the harassers were state employees working directly for him. Another "voter educator" hired by the state's Democratic Party had been convicted of armed robbery. After 2,000 signatures were thrown out on technical grounds, the recall effort fell 700 signatures short. Representative government will remain the enduring feature of American democracy, but the initiative process is a valuable safety valve. So long as elected officials gerrymander their districts and otherwise make it nearly impossible for voters to oust them, direct lawmaking will be popular. That's why attempts to arbitrarily curb the initiative, or to intimidate people from exercising their right to participate, must be resisted. It's a civil liberties issue that should unite people of good will on both the right and left. You have to hand it to Pixar. Since Woody and Buzz Lightyear first charmed audiences in Toy Story, the studio has consistently managed to create characters that are imaginative, intelligent, and hugely popular. Despite the vast sums its movies gross, Pixar has yet to give in to the temptation to churn out a quick copy of a past hit to turn an even quicker buck. Instead, from The Incredibles to Ratatouille, each of its productions feels like a carefully considered original. WALL•E, which [hit] theaters on June 27, is no exception. In the last few years, animated movies have been characterized by a kind of hyper-wordplay with the most frenetic comedic actors filling the main roles (think Shrek, Happy Feet, or, most recently, Kung-Fu Panda). Director and screenwriter Andrew Stanton takes WALL•E in a completely different direction. Throughout the film, the last little robot on an abandoned Earth says no more than a handful of words (though he says those few many, many times). Instead, as a near-genius score plays in the background, WALL•E (Waste Allocation Load Lifter Earth-Class) communicates almost entirely with facial expressions and movement. Even when he meets EVE (Extra-terrestrial Vegetation Evaluator), and leaves Earth to follow her to a densely populated cruise ship in space, the film's reliance on physicality rather than on words doesn't change. At times, as the little trash compactor interacts with a delightful array of robots—each manifesting its own unique personality with whirs and tilts—WALL•E plays like a new breed of silent film. Another quintessential Pixar quality is how complex its themes tend to be compared to most kids' entertainment. Not many animated movies are told from the perspective of the parent, like Finding Nemo, rather than child. Nor have many championed achievement rather than fairness, like The Incredibles. And though on the surface WALL•E looks like it's selling the easiest, trendiest message going today—environmentalism—it's too smart for that. True, the foundation for the story is that humanity has left the planet heaped in garbage. But far weightier themes—like how technology distances us from the wonder of creation and how that distance cripples us spiritually—play a bigger role. In fact, if Stanton criticizes people for anything, it's for worship of leisure. Because they live to be cared for rather than to care, the few human beings WALL•E meets have become, to use Stanton's words, giant babies—literally feeding on milk rather than solid food. In contrast, WALL•E, the meek little trash collector, accepts stewardship in a way that people have rejected. And because love springs from service, he comes to love the creatures that inhabit Earth. That's not an environmental message, it's a biblical one. bi-partisan pandering (or ignorance) by the Senate on "speculators"
From the AP's Andrew Taylor in the C-J, news that the Senate unanimously passed legislation aimed at those (supposed) b&*@#:*s-- the "speculators". And their solution? Drastically limiting the number of speculators-- in other words, giving the remaining speculators more market power. Brilliant! The U.S. Senate is moving ahead with a Democratic plan to curb speculation in oil markets that has been blamed for some of the recent run-up in oil prices. A 94-0 vote this past week cleared a procedural hurdle for the legislation, which would require the Commodity Futures Trading Commission to set limits on trading in oil markets by investors and speculators. 94-0! One more reason why Republicans are often little improvement over Democrats on matters economic. Despite the big tally, however, the rival parties are bitterly divided on how to address high gasoline prices and an underlying stalemate remains. To drill or not to drill? That is the only question with which they will apparently wrestle! To take your money and subsidize energy companies? There's no debate there (except Republicans want to subsidize oil companies too)! To continue devaluing the dollar and driving up oil (and other) prices-- by spending money and running up debt? No mention of that either-- because of their ignorance of its import or an unwillingness to take the appropriate steps. These Democrats are ignorant or pandering or both. Bingaman is confused. Adding more "price signals" does tend a market away from equilibrium, but increases the competitive nature of a market and the likelihood that the market will better approach equilibrium. But there is evidence to the contrary. A federal task force set up to examine the sharp run-up in oil prices said in an interim report that fundamental supply-and-demand factors are most likely to blame. "Nobody can say with a straight face that simply addressing speculation -- a very narrow part of the problem -- is a serious approach," said Senate Minority Leader Mitch McConnell of Kentucky. For Republicans, the drilling question is one of the few issues where they have an edge with voters, and they're pressing it to the hilt. Even though new offshore leases wouldn't deliver oil to the marketplace for a decade or so, some Republicans say simply opening up new coastal areas to exploration would lower prices now. crazy talk from the C-J on "speculators"
For better or worse, this looks like an attempt to bang on McConnell. But presumably it stems from the writer's ignorance about markets in general and futures markets in particular. I love the claim toward the end that speculators are responsible for a significant part of the price increase-- while drilling will have no impact on, uhhh, the futures market! What a fraud Mitch McConnell is, when it comes to the ruinous gasoline price hikes that have hit consumers across Kentucky, and America. Senate Democrats tried to curb the rampant speculation that experts say is part of the reason gas prices are so high. They were blocked by Mr. McConnell and his GOP followers. "I'm with the guy at the pump," Mr. McConnell claimed. That's not true. He's with the oil guy in the White House. He even tried to blame his 2008 Democratic opponent, Bruce Lunsford, for the gasoline price hike, which of course is a national phenomenon. How desperate is that? Kentuckians know full well that gas has gone up everywhere, for many reasons, including the energy appetite of quickly developing nations like India and China, a shortage of new refinery capacity, instability in oil-producing countries and years of chaos that kept Iraq's oil production stuck below prewar levels. Mitch McConnell and his White House friends have done little or nothing about other major causes, like our national refusal to swear off the oil economy and to develop alternative energy sources. They have done little to effectively move Detroit toward building fuel efficient vehicles and getting out front on hybrids. Last week there was a chance to do something about the oil speculators, who have played the situation and made it worse. But Mitch McConnell said no. He and the oil industry crowd around George W. Bush propose that we drill our way to lower prices by opening up fragile areas. But such help would be years in coming and have little impact. There is a critical domestic issue, and the Senate had a chance to start doing something about it, by handcuffing the speculators who have milked this crisis for all it's worth -- to them. But Mitch McConnell and his crowd said no. With the recent report on the war powers written by former Secretaries of State James Baker and Warren Christopher and in light of some questionable foreign policy powers assumed by President George W. Bush, it is imperative that we review what the Founding Fathers had to say about war powers and foreign policy. Not surprisingly, the list of presidential foreign policy powers found in the Constitution is short. He can receive foreign ambassadors. He has powers that are shared with Congress: treaties and appointments. The final and most important power is that the President is designated as Commander-in-Chief. All Presidents since WWII have argued that this is their primary source of authority in foreign policy; however our Founding Fathers had a very limited interpretation of this title. Alexander Hamilton stated that it was to promote a unified command structure that assigned accountability to one person and to ensure civilian control over the military. The Founding Fathers never intended this title to allow a president to initiate offensive wars against other countries and Supreme Court Justice Robert Jackson in the famous Steel Seizure case of 1952 reiterated the narrow, Founding Fathers’ interpretation of the title Commander-in-Chief. Also not surprisingly, one finds an impressive list of congressional foreign policy powers in the Constitution: (1) to declare war; (2) to define and punish piracies and felonies on the high seas, and offenses against the law of nations; (3) to grant letters of marque and reprisal; (4) to make rules concerning captures on land and water; (5) to raise and support armies; (6) to provide and maintain a navy; (7) to make rules for the government and regulation of the land and naval forces; (8) to provide for calling forth the militia to execute the laws of the union, suppress insurrections and repel invasions; (9) to regulate commerce with foreign nations; and (10) to tax, spend, and borrow. These substantial powers reflect the Founding Fathers’ fear of a presidential monopoly in foreign affairs. The failure of Congress to exercise its foreign policy powers and serve as a check on Presidential power in foreign policy has almost always created major problems for the US. Korea in the 50s, Vietnam in the 60s and 70s, Nicaragua in the 80s, and Iraq today can be cited as examples. With regards to the war powers, prior to 1950 Presidents occasionally used force without Congressional authority but these were minor actions, none were major conflicts. Nevertheless, three times since 1950 the President has illegally bypassed the Congress and taken us into major conflicts or wars: President Truman in Korea in 1950, President Clinton in Kosovo in 1999, and President Bush in Iraq in 2003. The Iraqi decision is informative. Congress passed legislation which allowed President Bush to make the decision whether or not to use force against Iraq. This was at best a clear abdication of Congress’ constitutional authority and responsibility to decide to go to war and at worst an unconstitutional grant of the war decision power to the President. Former Congressman Lee Hamilton has written extensively about the fact that Congress has basically ceded its constitutional budgetary powers to the executive branch. This has also happened with the war powers and foreign policy in general. Yet, it is clear that this is a perversion of what our Founding Fathers intended. When are we going to have checks and balances when it comes to foreign policy? When will Congress exercise its institutional prerogatives in war powers and foreign policy and prevent another King George? “Christ did not come to preach any brand new morality. The Golden Rule of the New Testament (do as you would be done by) is a summing up of what everyone, at bottom, had always known to be right. Really great moral teachers never do introduce new moralities: it is quacks and cranks who do that. As Dr. Johnson said, ‘People need to be reminded more often than they need to be instructed.' The real job of every moral teacher is to keep on bringing us back, time after time, to the old simple principles which we are all so anxious not to see." Satan does not here fill us with hatred of God, but with forgetfulness of God. A great example of this is Esau-- who was "a good guy" (you'd rather have him baby-sit your kids than his younger brother, Jacob), but uninterested in the "things of God" (willing to sell the promises of God for a bowl of soup). The evil wrought by those who intend evil is negligible. The greater evil is wrought by those who intend good, and are convinced they know how to bring it about; and the greater their power to bring it about, the greater the evil they achieve while trying to do it. One of the strangest things that people say is, "I'm a good person." I am always amazed when people claim to know that about themselves. … History demonstrates, repeatedly, that if enough people begin to define themselves as "good" in contrast to others who are "bad," those others come to be seen as less than human. After weeks 1, 2, and 3 of our study of Habakkuk, we wrap up with a happy ending-- not in terms of circumstance (which turned out worse than expected) but in terms of faith and character. C.S. Lewis drew an analogy between faith and a rope: "You never know how much you believe anything until its truth or falsehood is a matter of life and death. It is easy to say you believe a rope to be strong and sound as long as you are merely using it to cord a box. But suppose you had to hang by that rope over a precipice. Wouldn't you then first discover how much you really trusted it?...Only a real risk tests the reality of a belief." God, again, responds to Habakkuk-- this time with instructions (2:2-3), prophecy of judgment (2:5) and the punchline (2:4's the just shall live by [their] faith). What is faith? Hebrews 11:1 says it has to do with the "unseen". If I said I held a paperclip in my fist, would you believe? Yes or no? What if I added the testimony of others? Yes or no? If I showed you? No, now you know, rather than "believe". "...if serving the LORD seems undesirable to you, then choose for yourselves this day whom you will serve, whether the gods your forefathers served beyond the River, or the gods of the Amorites, in whose land you are living. But as for me and my household, we will serve the LORD." -We are all worshipers. We all make a choice. (In a related point, all religions or religion-like belief systems have stories about creation, fall, redemption and eschatology-- whether Marxism or Environmentalism.) Here, Kyle quoted Peter Kreeft: "The opposite of theism is not atheism but idolatry." -Idolatry can be directed toward good things or bad things, "but when good things become god things", then you've fallen into idolatry. We're often not seduced by poison as much as apple pie (or too much of it). We're not sacked by our enemies as much as God's gifts-- and worshiping the gifts rather than the Giver. -Josh 24:15 indicates two primary sources for idolatry: tradition/family and culture. -Biblically, idolatry is tied to adultery (for the believer, loving another god) and God's "jealousy"
-The term for "choose" implies an on-going choice or choosing rather than a one-time 0/1 choice. 2. What do you sacrifice time and money for (calendar and checkbook)? 3. What do you worry about? What are you most afraid of? What would be terrible to lose? 4. Where do you go when you hurt? Where do you go for comfort? 5. What makes you mad? 6. What do you dream of? What gets you passionate? 8. Whose applause/approval do you long for? Or try something more risky and useful: ask those who love you to answer the same questions about you! The judiciary is becoming an important election issue. John McCain is warning conservatives that control of today's finely balanced Supreme Court depends on his election. Unfortunately, his jurisprudence is likely to be anything but conservative. The idea of a "living Constitution" long has been popular on the political left. Conservatives routinely dismiss such result-oriented justice, denouncing "judicial activism" and proclaiming their fidelity to "original intent." However, many Republicans, like Mr. McCain, are just as result-oriented as their Democratic opponents. They only disagree over the result desired. Judge-made rights are wrong because there is no constitutional warrant behind them. The Constitution leaves most decisions up to the normal political process. However, the Constitution sometimes requires decisions or action by judges – "judicial activism," if you will – to ensure the country's fundamental law is followed. Thus, for example, if government improperly restricts free speech – think the McCain-Feingold law's ban on issue ads – the courts have an obligation to void the law. The same goes for efforts by government to ban firearms ownership, as the Court ruled this term in striking down the District of Columbia gun ban. Yet even as Republicans support and defend the Second Amendment, they ignore the Constitution when it says that only Congress can suspend habeas corpus, and then only in event of an invasion or rebellion. And if a president says we are "at war," Republicans believe he can ignore laws passed by Congress. Mr. McCain is a convenient convert to the cause of sound judicial appointments. He has never paid much attention to judicial philosophy, backing both Clinton Supreme Court nominees – Stephen Breyer and Ruth Bader Ginsburg. He also participated in the so-called "Gang of 14," which favored centrist over conservative nominees as part of a compromise between President George W. Bush and Senate Democrats. But even if a President McCain were to influence the court, it would not likely be in a genuinely conservative direction. His jurisprudence is not conservative. For instance, most conservatives believe that the First Amendment safeguards political speech. Mr. McCain does not. Indeed, it is the liberal bloc which upheld McCain-Feingold's restrictions on ads criticizing incumbent politicians, while the conservative members, led by Chief Justice Roberts and Justice Samuel Alito, forged a more recent majority overturning parts of McCain-Feingold. In his May 2008 speech on judges at Wake Forest University, Mr. McCain talked about the importance of "the constitutional restraint on power," but in practice he recognizes no limits on government or executive-branch authority. In fact, if Mr. McCain nominated someone in his own image, the appointee would disagree with not only the doctrine of enumerated powers, which limits the federal government to only those tasks explicitly authorized by the Constitution, but also the Constitution's system of checks and balances, and even its explicit grant of the law-making power to Congress. Mr. McCain has endorsed, in action if not rhetoric, the theory of the "unitary executive," which leaves the president unconstrained by Congress or the courts. Republicans like Mr. McCain believe the president as commander in chief of the military can do almost anything, including deny Americans arrested in America protection of the Constitution and access to the courts. It is important to choose judicial nominees carefully. But that is no reason for conservatives to vote for Mr. McCain. He has demonstrated no more interest in "conserving" the Constitution, and its principles of limited government and individual liberty, than has Mr. Obama. The best way to get better judges is to expand candidate choice beyond the Republicans and Democrats. Supporting the political status quo guarantees more jurisprudence based on political convenience, not constitutional principle. The 11th commandment of politics is that elected officials shall not take sides in their party primaries. Then again, Missouri Republicans are burdened with so many sins, what's one more? For an insight as to why the GOP is down and out in Washington, take a look at Jefferson City. That's where Sarah Steelman, the state treasurer, is running in an Aug. 5 primary for the Missouri governorship. And it's where her reform campaign against earmarks and self-dealing is threatening the entrenched status quo, causing her own party to rise against her. So bitter are House Minority Whip Roy Blunt and Sen. Kit Bond at Ms. Steelman's attack on their cherished spending beliefs that last month they rallied the entire Missouri congressional delegation to put out a public statement openly criticizing her campaign against six-term U.S. Rep. Kenny Hulshof. Joining them in their support of Mr. Hulshof has been the vast majority of the state Republican machine. Ms. Steelman is clearly doing something right. Her sin is in fact to belong to that new mold of Republican – Louisiana Gov. Bobby Jindal, Alaska Gov. Sarah Palin, Sens. Tom Coburn and Jim DeMint – who know it's no longer enough to simply hawk lower taxes. In 10 years as a state legislator and treasurer, her target has been the slothful political favor factory that's led Republicans away from small-government principles and outraged conservative voters. And, oh, the howls of misery. Ms. Steelman's Republican colleagues were livid with her attempt to strip them of comfy pensions, annoyed with her "sunshine law" requiring them to be more open in their dealings, furious at her attacks on their ethanol boondoggles, appalled that she criticized GOP state Speaker Rod Jetton for moonlighting as a paid political consultant. The final straw was her temerity to make her primary race about her opponent's Washington earmarking record. For Mr. Blunt, this is also just a wee bit personal. His son, Matt, is the outgoing governor, and has been on the receiving end of a few Treasurer Steelman blasts. Last year she stopped payment on a $70,000 secret check his administration cut to settle a sexual harassment suit against an official. Her demand for transparency blew the case into the open, infuriating GOP colleagues. There was also Ms. Steelman's attempted cleanup of an ethanol program. The treasurer announced her office would no longer provide below-market interest rates for ethanol plants that counted state officials or their relatives among investors. Among companies barred was Show Me Ethanol, whose shareholders included Mr. Blunt's son Andy – one of the state's top lobbyists – as well as Republican state Rep. John Quinn and his wife, not to mention the wife of Republican U.S. Rep. Sam Graves. Instead of thanking Ms. Steelman for ridding it of this conflict, in May the Missouri state senate voted to overturn her policy. It did so with a head-count vote, so as to avoid a written record. Undaunted, Ms. Steelman has made ethics reform the centerpiece of her campaign. Mr. Hulshof has been able to tout his own history as an ethics reformer, though the fervor with which his party's regulars have embraced him has undercut that message. His real weakness is that despite conservative credentials on taxes or social issues, he's run wild with the GOP crowd that just won't relinquish the pork. Which is of course why Mr. Blunt (who pioneered House earmarks) and Mr. Bond (who sits at earmark central, the Senate appropriations committee) love him. Ms. Steelman's ads have noted Mr. Hulshof's support for the Alaskan Bridge to Nowhere, the Maine Lobster Institute, the Perfect Christmas Tree exhibit and the Woodstock concert hall. Their first debate last week centered on Mr. Hulshof's spending record. In an interview with a local reporter, he felt so cornered that he asked the interviewer what earmarks have "to do" with being "governor" anyway. If Ms. Steelman's bid shows anything, it's how determined a wandering Republican Party, both nationally and locally, is to hold on to the bad habits that lost them their reputation. Beware to the reformer.